TALES OF SUSPENSE #59 CGC 4.5 SS SIGNED BY STAN LEE! 1ST SA SOLO CAPT AMERICA!! 100 - First Solo Appearence. Marvel Comics. The Back Cover corner of 100 is torn - see photos. Issue Numbers. Condition VG-. 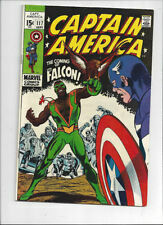 Key 1st Appearance Of The Falcon. The pages are bright tan with sharp corners. The cover has multiple creases and the bottom cover is detached from the staple. There are multiple tears and minor tape repair in the rear cover. All comics are sent boarded and bagged in high-grade mylar sleeves. I will combine purchases to reduce postage costs. TALES OF SUSPENSE #68 CGC 9.2 SS SIGNED BY STAN LEE! THE RED SKULL APPEARANCE! JACK KIRBY & STEVE DITKO ARTWORK! With Stan Lee's heart-breaking passing, one thing remains clear: there are now only a fixed number of Stan Lee signed comics available. What's left of his signature is what is on the planet currently. 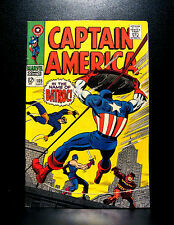 Captain America #100 - HIGHER GRADE - MARVEL 1968 - flashback on Cap's revival! 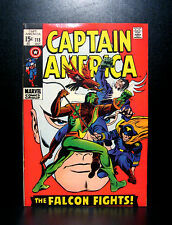 Sub-Mariner and The Avengers Appearances!". Beautiful HIGHER GRADE example - with Excellent Gloss quality! (1st App & ORIGIN of Moon Knight) Werewolf By Night #32. (1st App & ORIGIN of Mysterio) Amazing Spider-Man #13. 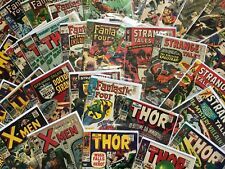 Huge Comic Silver Bronze Age CAPTAIN AMERICA LOT Jack Kirby Art 106-213 L@@k!! Huge Comic Silver Bronze Age CAPTAIN AMERICA LOT Jack Kirby Art 106-213 L@@k!!. You get all the comics in the pictures. Most are in great condition. 106,123,127,128,129,187,189,193,196,199,205,208,209,210,211,212x2,213x2 Thanks for looking! TALES OF SUSPENSE #96 CGC 8.5 W/P SS SIGN BY STAN LEE-JACK KIRBY COVER & STORY! TALES OF SUSPENSE #63 CGC 3.5 SS SIGN BY STAN LEE-1ST SA ORIGIN OF CAPT AMERICA! TALES OF SUSPENSE #64 CGC 5.0 SS SIGNED BY STAN LEE-1ST BLACK WIDOW IN COSTUME! TALES OF SUSPENSE #70 CGC 9.0 SS SIGNED BY STAN LEE! KIRBY ART! TITANIUM MAN! TALES OF SUSPENSE #80 CGC 6.0 SIGNED BY STAN LEE! 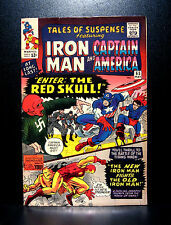 CLASSIC RED SKULL COVER! TALES OF SUSPENSE #54 CGC 4.0 SS SIGNED BY STAN LEE! THE MANDARIN/THE WATCHER!! THE WATCHER BACK-UP STORY! With Stan Lee's heart-breaking passing, one thing remains clear: there are now only a fixed number of Stan Lee signed comics available. What's left of his signature is what is on the planet currently. Tales of Suspense 57. No Flimsy Envelopes. 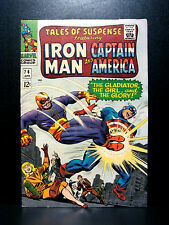 1964 TALES OF SUSPENSE #60 *Captain America & Iron Man *2nd Hawkeye! *Very Nice! Very Nice! The book has mild/normal signs of reading/handling, supple paper, solid and complete. Any other obvious details are in the photos. Lot's of Great Silver Age Marvel this week! Golden age through the 90's. Marvel Masterworks. Hardback Variant Cover Edition. factory sealed. There are hundreds of duplicates and unread comics, Graphic Novels and books in my collection which because of the amount, I will probably never read. One of the Nicest Cap #100's I've Seen! TALES OF SUSPENSE #72 CGC 8.5 SS SIGNED BY STAN LEE-THE SCARLET WITCH/RED SKULL! TALES OF SUSPENSE #19 CGC 5.0 SS SIGN BY STAN LEE-JACK KIRBY & STEVE DITKO ART! TALES OF SUSPENSE #65 CGC 7.0 SIGNED STAN LEE! KIRBY-1ST SA APP THE RED SKULL! 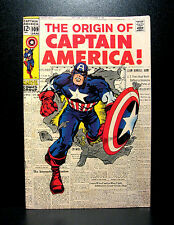 (So I have collected many comics, Graphic Novels and books since the sixties'. Big Premiere Issue. Giant Size etc. will increase the weight and size, so will cost more a little more). 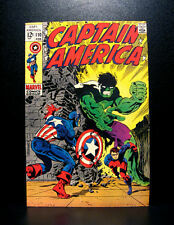 Marvel Silver Age1968. I SENT A NUMBER OF MY COMICS LAST YEAR BOTH TO CGC AND CBCS. Once my comics have "Gone", they have "GONE" I am not a dealer. Why take chances on small grainy photo's described with grossly inflated grades??. TALES OF SUSPENSE #61 CGC 9.0 WP SIGNED STAN LEE! JACK KIRBY COVER/ART-MANDARIN! TALES OF SUSPENSE #66 CGC 6.5 SIGNED STAN LEE! 1ST SA APP/ORIGIN-THE RED SKULL!